A club night by people with learning difficulties for everyone. 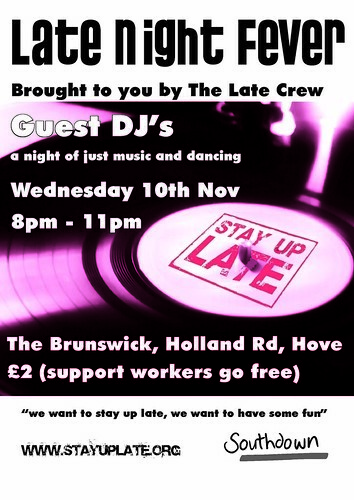 The Late Crew is a bunch of DJs (experinecd and begginers) who are organising a new night in Brighton. The Late Crew will ot only be a place for anyone to go and have fun but our aim is also that we hardly spend any money on the night so we can show other people how to set up thier own nights for next to nothing. Expect DJ sets from members of Heavy Load (you can only guess what that’s going to be like! ), metal, cheese, pop and Michael Bolton. The first night will be held at the Brunswick on wed. 10th Nov. also with DJ’s such as Megamix and Ross da boss Crawford playing a varied selection of music from 8-11. £2 entry, support workers go free. It’s for over 18’s only and and proceeds go back into the campain. Sounds Great, a lot of interest from our service! I am wondering if you have to reserve places for late nite fever or whether you can just come along? Thanks for getting in touch and yes just come along. We have no idea of how many people will come or what might happen. We don’t even know how many DJs may turn up – it’s a real experiment.